George Friedman, Founder and Chairman of Stratfor, or what is called by many “private/shadow CIA” for its well known connections and close cooperation with the CIA, gave a very interesting speech to the Chicago Council of Foreign Affairs on subject Europe: Destined for Conflict? in February of this year. This speech came after another interesting interview where he admits that the overthrow of Yanukovych was “the most blatant coup in history” and among other things the American “payback” for Russian involvement in Syria. In my humble opinion, this is one of the most important speeches in years I’ve heard, blatantly presenting neo-con perspective that dictates Washington’s foreign policy. 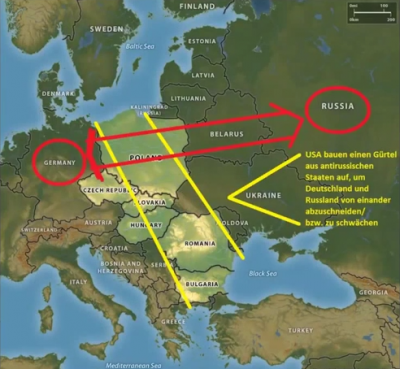 Germany is in very peculiar position and they have a very complex relationship with Russians. The Germans themselves don’t know what to do and haven’t made up their mind. For the US, the primordial fear is German capital and technology and Russian natural resources and manpower. This combination for centuries has scared the United States. Whoever can tell me what the Germans will do will tell me the next 20 years of the history. The main problem of Germany is that it is enormously economically powerful and geopolitically very fragile and doesn’t know how to reconcile two. “The German Question” is coming up again. That’s the next question we need to address, and we don’t know how to address it, we don’t know what they’re going to do. Watch the video. His candor is astonishing. The people in control of the US military are insane and are taking Americans headlong into wars that will lead to armageddon.